With just two days until Christmas, most of the shopping, social gatherings, and anticipation are behind us. I adore December and all the kitchy Christmas music and traditions - yet I often sigh a breath of relief around this time. I swing into the Christmas season with high hopes and demanding expectations, wanting to squeeze every last drop of holiday spirit into my days. This can often leave me feeling a little deflated, as I rarely have the time to cross everything off my mental list. I am slowly learning to find more beauty in a simplified season. I love everything Christmas offers - but stripping down the expectations actually allows me to enjoy it all the more. And while it's a learning process, I believe this is the place to start - letting go of expectations. Here are 5 areas I'm starting with and hoping to carry into next year's holiday. We have a box of Christmas decorations - most of the items we purchased our first married Christmas. Each year, I put every item out alongside random additions. This year, if I didn't have a great spot for it, it stayed in the box. We got a smaller tree for our living room and just pulled out our favorite (and size-appropriate) ornaments. 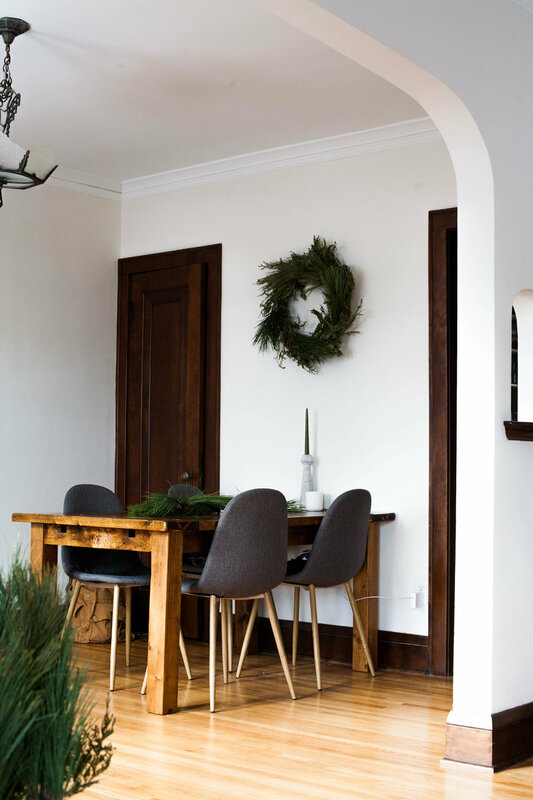 I snagged some extra greenery from the Christmas tree market and made a loose table garland and a fresh wreath to hang above my table. The remaining branches stayed in a cream planter I hadn't filled yet. It was a holding place more than anything - but I ended up loving the green so much, it never moved. I've been snipping off small sections of the branches to tie to gifts as well. Keeping it natural not only helps the budget, it makes the transition to January much easier. 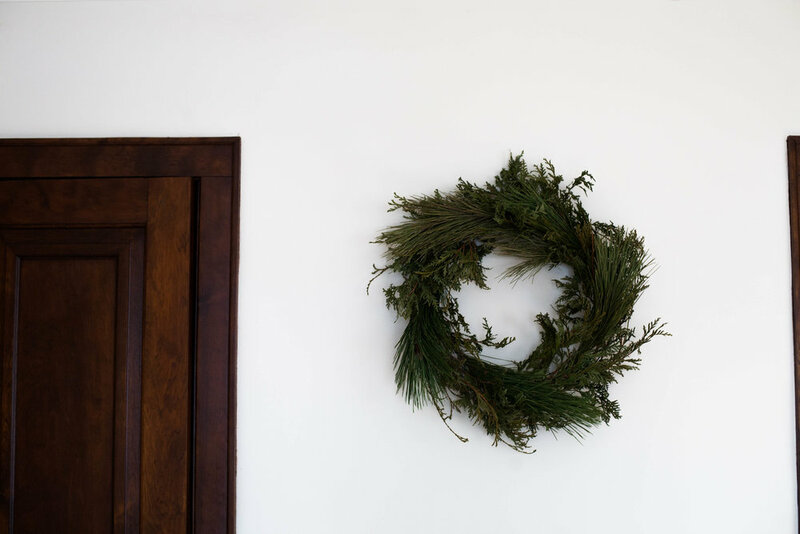 Pieces of greenery can easily serve as decor through winter months, as can small house plants, white vases, or winter-scented candles. This candle can be found here - I'm in love with this Chestnut & Clove scent. We all see the posts from our favorite food bloggers entitled "72 Christmas cookies you MUST try" or "How to make a candy tray for your party of 90!" Maybe we could choose just one new and more time-extensive recipe to try. I don't think I've ever (yes, you read that right) made a cake as an adult and without a box mix. I don't bake often, and if I do I go more for a fruit based dessert or sweet bread. However, the cake fever hit this year, so for our small group Christmas party, Isaac and I made this Cranberry Orange cake. It fulfilled all my baking wishes - I think I'm good until next year. Many of us have recipes we've had our eye on, but seem a little too special or time-consuming. Pick one recipe and one afternoon, blast your embarrassing Christmas music, and go for it. I've had this, this, and these saved - but you know, there's always New Years' or next season. 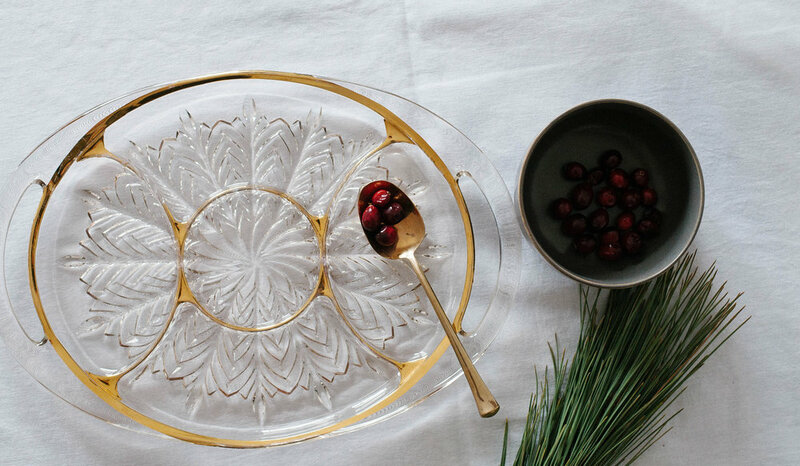 Shop this winter serving dish here. Shop this catchall basket here. 3) Gatherings. We all have ugly sweaters we could pull out or terrible (perfect) white elephant gifts stuffed in the back corners of our closets, but parties and gatherings can be simpler than this too. Pulling out cheese, crackers and wine is enough. Putting on a record and offering a drink is enough. Spending time with friends in December can be absolutely what you want - but they don't have to be anything. Some of my favorite nights are spent sitting around a good snack while talking about everything and nothing. Other ideas could be gathering for a holiday movie, meeting someone for a winter run, or knocking out some of your shopping with a friend. While there are actual items wrapped under our tree this year, we chose to make a few of our gifts experience or quality-time based. This is not a cop out! There can be so much intentionality behind gifting an experience. My husband and I have gotten each other one gift in our past Christmases, but this year we decided to save that money and put it towards a night away in January. We're planning to head further north or over to Wisconsin. We couldn't think of things we really wanted or needed, and having a mini-getaway to look forward to is so much more exciting for us. This is just one example, but gifts could look like making breakfast for your parents while home, babysitting for free so friends can enjoy a night out, or planning a destination hike with a friend. This season has had its easy days filled with glitter and Dean Martin and gumdrops, but it's also had hard days with tears and frustrations. If you're like me, you also have many friends walking through hard seasons, and Christmas doesn't mask those struggles. Just like parties, food, gifts, or decorations - our emotions don't have to look a certain way in December. On the hardest days, I've realized that I'm actually experiencing Christmas in its truest form. Christmas stripped down is nothing but the reminder of Jesus coming to Earth as a baby, working and serving on the Earth, and dying on a cross. All so that in our lowest moments or greatest weaknesses, we can have ultimate hope and strength. Christmas reminds us that everything is temporary but life with Him. His birth, death, and resurrection has given me life. This hope never feels more necessary, real, or amazing than on bad days. As we step out of the fast pace weeks of anticipation and into relaxed days off work and with family - I hope we can let go of every expectation and just enjoy the moments. Merriest Christmas, friends!